Now at its 9th edition, the Nactus Award Competition is an international showcase for the very best reptile and amphibian photography. Both professionals and amateurs are welcome to enter as achieving the perfect picture is down to a mixture of skill, vision, originality, knowledge of nature and luck. Each edition thousands of entries are received and judged by a specially selected expert panel. The nominees are announced on the Exo Terra website where public voting will determine the winner of each category. The overall winner will be our jurors out of the 6 category winners. The Nactus Award is an herpetological photography competition. Its purpose is to discover the best reptile and amphibian pictures taken by photographers worldwide and to inspire their visionary and expressive interpretations of nature. The competition is open to anyone, amateur or professional, of any legal age and of any nationality. As only digital images are accepted in the competition, the judges will place emphasis on ensuring that the images faithfully represent nature. Take centre stage at the Nactus Award ceremony in Tucson, Arizona, USA. The Nactus Award gets its name from the gecko genus ‘Nactus’, which inhabit islands in the Pacific, Indian Oceans and Oceania. The 1,5 kg statue is made of solid brass and marble. 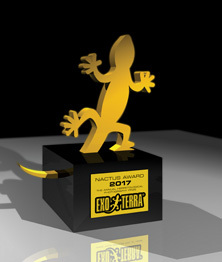 The Nactus Award Ceremony will be held at the 2017 Tucson Reptile Show in the Tucson Expo Centre in Arizona, USA on October 7th 2017. All nominees will receive their professionally framed image with personalised plaque.